Use of a special self-lubricated bearing resulting in no need for external flushing. Special Design allowing for reduced maintenance and accommodation in reduced space. Multi-stage impeller type providing high lift capability. Screen Wash, Sea Water Intake Pump. Water treatment and distribution applications. Wide range of Industry services. 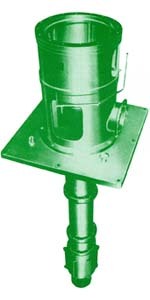 For cast-iron material the pump model is VTF/VMF. 3. Other special material can be available upon request. 1 floor type and 2 floor type channels are available. 6,000mm:bore size between 50mm and 80mm. 8,000mm:bore size between 100mm and 300mm. Above sizes are available upon request. Engine direct driven type with coupling can be provided. Can be provided for Pumps with bore size over 100mm upon request.